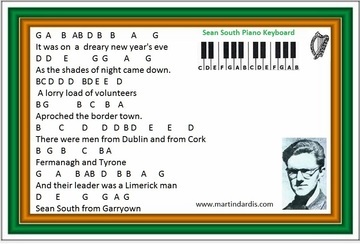 This is the very same tune you would play for Roddy McCorley, the song about Roddy MaCorley was written before Sean South From Garryowen. The first piece of music is for whistle in the key of D, and the second I have done in the key of C. The youtube video is of myself playing, I just play the first verse as there's no chorus and the other verses are the same. For those of you just starting out on the piano keyboard you may notice that some words with 2 syllables for example may have 3 or more notes. Even single words like in this song ''It Was On ''A'' Dreary New Year's Eve'' , notice the 2 notes used on the letter ''A'' . If your wondering why there are 2 notes used then it's because it just makes the tune more interesting to play. You could easy leave the extra notes out if you want but you'll find that the tune actually sounds better when they are left in.